Where does the market take this BaT offering? Nearly stock 2002 Ti with exception exception for the fuel filter/Gas line. Absolutely beautiful ! Thank you so very much for posting pictures. It looks like a great collection of tidy, original BMWs. Hello my TI brothers, This car came with a factory close ratio five-speed gearbox. The original owner was disappointed, he wanted an overdrive five-speed. Tony Robertson who owned this car prior to myself spoke with the original owner. The original gear shift knob was taken off and replaced with one from a girlfriend early on. I found a correct five-speed dog leg gear box shift knob and put it on the car, has my TISA also has one. The metallic tab on the valve cover is one I made to locate the fuel line. The marker lights/Turn signals on the car are as I bought it. I was surprised, I thought it would have European turn signals. I bought a set for the car but have not gotten around to putting them on. The small front bumper over riders are correct, they are European specification. 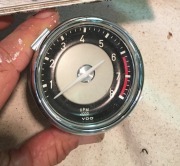 The Dashboard has the early chrome trim. As regards the earlier question, no brake light is located on the instrument cluster. The dashboard should be in early three-piece design. The color was originally Granada red, the car was repainted non-– original BMW Verona red. The car was originally Ziebart -ed and has required significant rust repair. The front nose was replaced in Canada. On The car is fun to drive and has Bill Stein heavy duty shock absorbers and lowering springs on it. I rebuilt all the brakes but have otherwise largely left it alone other than body work. It is something of a time capsule, which I appreciate more and more in life. Best regards, Peter PS, Tony is leaning against the car in the first picture. Tempus fugit, this was several years ago. I believe he is living in Vancouver now, he is in many ways the Godfather of the 2002/1600 TI section.